Good news for Nokia 3 Users, Latest Android 8.0 Oreo update for Nokia 3 is now available for download. The Nokia 3 Oreo Update is a beta Oreo build which comes with a version v3.220. If you want to Install Oreo 8.0 on Nokia 3 or want to Update Nokia 3 to Android 8.0 Oreo Manually then you are in right place. Here we share a guide to Download and Install Android 8.0 Oreo On Nokia 3. Nokia 3 Oreo build brings all Android Oreo Features along with floating Navigation dock, home screen shortcuts, PIP mode, and lots of new features and settings. Other than that Nokia 3 Android 8.0 Oreo update comes with many new features and bug fixes. 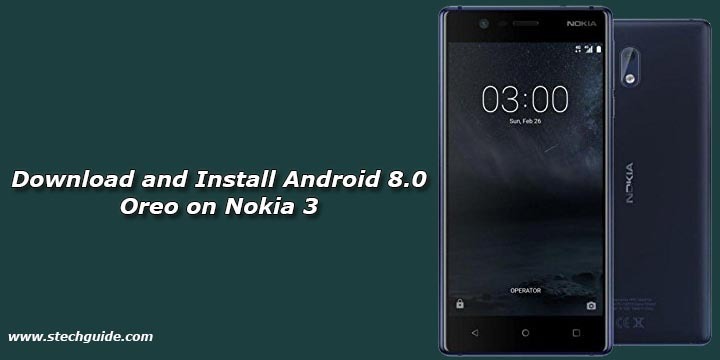 Follow below guide to Download and Install Android 8.0 Oreo On Nokia 3. Nokia 3 Android 8.0 Oreo firmware update is available for all variants. The update is a stable version and soon will roll out via OTA for all users. Android Oreo update for Nokia 3 comes with a build number v3.220. Download and Install Android 8.0 Oreo Beta on Nokia 3 from below to update Nokia 3 to Android Oreo manually. This Firmware file is only for Nokia 3(TA-1032). Don’t try this on any other device. Below method is not tested so do it at your own risk. 1) First Download Oreo OTA zip for Nokia 3 from above and save it to your device. Press and hold the Volume Up + Power button until “Powered by Android” appear. Hold the button around 5 seconds and then release both buttons. 4) Download the OTA zip from above Copy ROM to a folder where adb installed.